Bob R Bogle, Frank Herbert: The Works. Self-published, 2012. Pp. c.760. ISBN 978-0-9855893-0-1. $6.50. Of one thing, there can be no doubt, this biography is a labour of love. 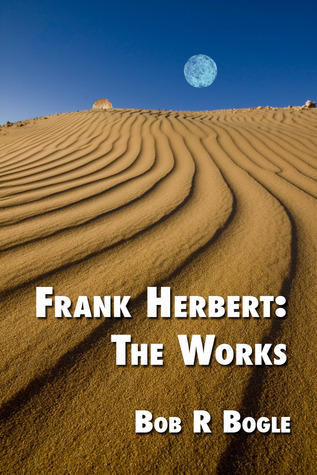 Frank Herbert: The Works is an overview of the life and written output of one of the most influential of post-war science fiction writers. Written in a clear, readable style, it is at once a fascinating account of the main points in Herbert’s life and an astonishingly in-depth analysis of his stories. The biographical element is detailed and methodical but lacks emotional impact. However, this is not intended to be a traditional biography, so this aspect of the work is an effective scene-setter for what is to come. Having said that, the biography does contain some intriguing insights, beginning with Herbert’s childhood in a somewhat nomadic family, presided over by alcoholic parents, his declaration that he wanted to be a writer at the age of eight and his love of adventure as epitomised by the boat he was given as a birthday present a year later. 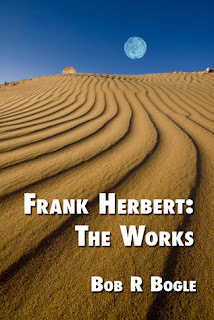 Frank Herbert embraced some interesting belief systems during his life, including a fascination with the borderlines and connections between the mind and the universe at large, to put it simply, where one ended and the other began. Some of this was inspired by events (some of them quite dramatic) in his life, by his reading and his search for meaning, and also by the burgeoning drug culture of the late 1950s and early 1960s, in which the expansion of mind was seen to be the motivation for narcotic use. Journalism gave Herbert his first taste of writing and acted as the springboard for his fledgling writing career. And this is where the book moves into its analytical phase. Each of Herbert’s stories, from his earliest sales to his masterwork are carefully dissected and given a thorough, and honest, critical appraisal. Although Bogle’s admiration of Frank Herbert and his work is evident, his devotion is not unquestioning. His lengthy review of Herbert’s first published novel, Dragon Under the Sea is brutally honest about the book’s shortcomings, as well as upbeat about the overall, enjoyable adventure story it tells. If Herbert was sloppy or failed in some way, to tell a good story well, then Bogle says so in no uncertain terms, which, of course, gives his book the integrity it needs in order for it to be considered a scholarly essay on a branch of literature sadly lacking, even now, in literary credibility. The main events of the times in which each story or novel were written are sketched as a background. These provide an anchor, a landscape over which Herbert’s work was painted and feed in to our understanding of where the ideas and philosophical energies of his fiction may have originated. Inevitably, there is Dune. This forms the main section of the work and the depth and detail of Bogle’s analysis is breath-taking. Every aspect of the universe Herbert created for and around the novel is explored, the eco-system of the planet itself, the motivations and emotional drivers of the main characters, all taken apart and reassemble with loving care. There is an exploration of foldspace, of the spice creation cycle, of genealogy, hinted at but never fully revealed in the novel itself. Reading this brought the whole Dune experience back into vivid life and not only awakened a somewhat nostalgic spirit but heightened my own love of the original book. The same deep and rigorous treatment is given to the subsequent Dune novels, the entire canon explored and opened up, even for someone like me, who did not enjoy the rest of the series with anything like my wonder at the first novel. This is a book primarily for Herbert aficionados. It is also a scholarly work which will reward time and study. It reads as a narrative, but is also a work for dipping into or as a research text. Do not approach this book as a simple biography of Frank Herbert’s life, but as a labour of love and heartfelt study of the man and his words.